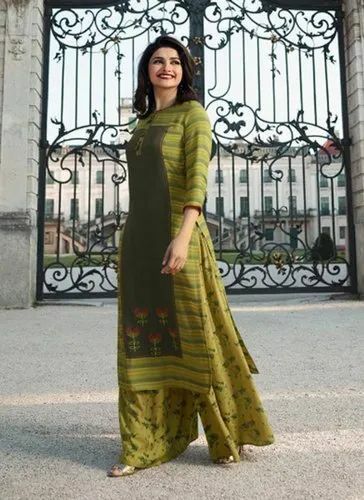 Pioneers in the industry, we offer printed kurtis palazzo set collection, rayon cotton zari work kurti with palazzo, palazzo kurti set, trendy kurtis with designer bottom, simple designs kurtis with palazzo and party wear palazzo kurti set from India. Latest Designs Palazzo-Kurtis Set Catalogue Have Cotton Fabric With Printed Work Kurtis.Its Comes With Cotton Printed Palazzo. Latest Designs Palazzo-Kurtis Set Catalogue Have Rayon Cotton Fabric With Zari Work Kurtis.Its Comes With Rayon Palazzo. Latest Designs Palazzo-Kurtis Set Catalogue Have Rayon Fabric With Printed Work Kurtis.Its Comes With Rayon Palazzo. Latest Designs Palazzo-Kurtis Set Catalogue Have Different Fabric With Embroidery Work Kurtis.Its Comes With Bottom. Latest Designs Palazzo-Kurtis Set Catalogue Have Rayon Fabric Kurtis.Its Comes With Rayon Palazzo. 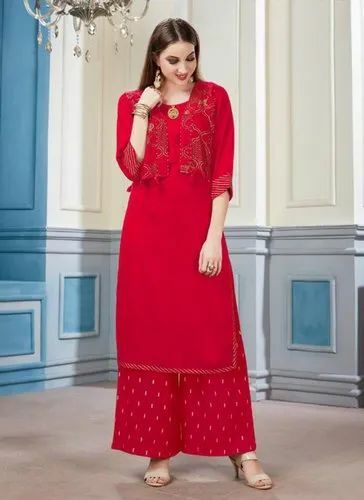 Latest Designs Palazzo-Kurtis Set Catalogue Have Cotton Fabric With Embroidery Work Kurtis.Its Comes With Rayon Palazzo. Latest Designs Palazzo-Kurtis Set Catalogue Have Rayon Fabric With Printed Work Kurtis.Its Comes With Palazzo. Latest Designs Palazzo-Kurtis Set Catalogue Have TWO TONE SLUB RAYON Fabric With Printed Work Kurtis.Its Comes With RAYON Printed Palazzo. Latest Designs Palazzo-Kurtis Set Catalogue Have Rayon Fabric Plain Kurtis.Its Comes With Rayon Printed Palazzo. Latest Designs Palazzo-Kurtis Set Catalogue Have Rayon Fabric With Zari Work Kurtis.Its Comes With Rayon Zari Work Palazzo. Latest Designs Palazzo-Kurtis Set Catalogue Have Rayon Fabric With Chex Printed Work Kurtis.Its Comes With Rayon Plain Palazzo. Palazzo-Kurtis Catalogue Have Rayon Fabric With Embroidery Work Kurtis.Its Comes With Palazzo. ***Kurtis Designer Kurtis Catalogue Have Rayon Fabric With Printed Work Kurtis.Its Comes With Only Rayon Printed Palazzo. Kurtis Designer Kurtis Catalogue Have Rayon Slub Fabric With Printed Work Kurtis.Its Comes With Only Rayon Printed Palazzo. Latest Designs Kurtis Catalogue Have Pure Silk Fabric Kurti With Embroidery Work.Its Comes With Only Pure Silk Palazzo.